HABIT: Clusters of small white flowers, followed by prickly husks with shiny black seeds. Very large, tropical looking foliage. CULTURE: Easy to grow in any soil, likes hot weather. Pinch off burr like seed capsules to prevent seed from maturing. USES: Bold texture, tall and quick-growing, inexpensive screen. PROBLEMS: Seeds are highly poisonous. Foliage and stems are also toxic and can cause severe skin irritation. The principle toxin of castor bean is ricin which is a lectin, also termed a toxalbumin. Ricin may comprise up to 3% of the seed weight. Toxalbumins are very toxic plant-derived compounds that combine carbohydrate and protein moieties or components. Ricin is water soluble and is not present in castor oil. Taken orally, ricin is readily absorbed from the stomach and intestine. Another phytotoxin in castor bean, ricinine, is reportedly goitrogenic, but the significance of this compound is not clearly established. Ricin is a poison found naturally in castor beans. If castor beans are chewed and swallowed, the released ricin can cause injury. 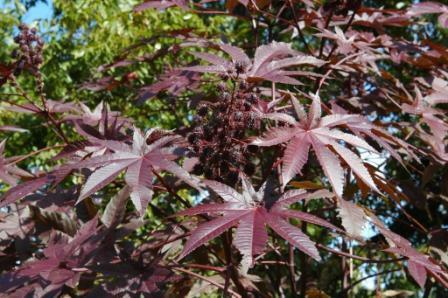 Ricin can be made from the waste material left over from processing castor beans. It can be in the form of a powder, a mist, or a pellet, or it can be dissolved in water or weak acid. It is a stable substance under normal conditions, but can be inactivated by heat above 80 degrees Centigrade. Castor beans are processed throughout the world to make castor oil. Ricin is part of the waste “mash” produced when castor oil is made. Ricin has been used experimentally in medicine to kill cancer cells. It would take a deliberate act to make ricin and use it to poison people. Accidental exposure to ricin is highly unlikely, except through the ingestion of castor beans. If made into a partially purified material or refined into a terrorist or warfare agent, ricin could be used to expose people through the air, food, or water. In 1978, Georgi Markov, a Bulgarian writer and journalist who was living in London, died after he was attacked by a man with an umbrella. The umbrella had been rigged to inject a poison ricin pellet under Markov’s skin. In the 1940s the U.S. military experimented with using ricin as a possible warfare agent. In some reports ricin has possibly been used as a warfare agent in the 1980s in Iraq and more recently by terrorist organizations. Ricin poisoning is not contagious. It cannot be spread from person to person through casual contact. Ricin works by getting inside the cells of a person’s body and preventing the cells from making the proteins they need. Without the proteins, cells die. Eventually this is harmful to the whole body, and death may occur. Effects of ricin poisoning depend on whether ricin was inhaled, ingested, or injected. The major symptoms of ricin poisoning depend on the route of exposure and the dose received, though many organs may be affected in severe cases. Initial symptoms of ricin poisoning by inhalation may occur within 8 hours of exposure. Following ingestion of ricin, initial symptoms typically occur in less than 6 hours. Inhalation: Within a few hours of inhaling significant amounts of ricin, the likely symptoms would be respiratory distress (difficulty breathing), fever, cough, nausea, and tightness in the chest. Heavy sweating may follow as well as fluid building up in the lungs (pulmonary edema). This would make breathing even more difficult, and the skin might turn blue. Excess fluid in the lungs would be diagnosed by x-ray or by listening to the chest with a stethoscope. Finally, low blood pressure and respiratory failure may occur, leading to death. In cases of known exposure to ricin, people having respiratory symptoms that started within 12 hours of inhaling ricin should seek medical care. Ingestion: If someone swallows a significant amount of ricin, he or she would develop vomiting and diarrhea that may become bloody. Severe dehydration may be the result, followed by low blood pressure. Other signs or symptoms may include hallucinations, seizures, and blood in the urine. Within several days, the person’s liver, spleen, and kidneys might stop working, and the person could die. Skin and eye exposure: Ricin is unlikely to be absorbed through normal skin. Contact with ricin powders or products may cause redness and pain of the skin and the eyes. Death from ricin poisoning could take place within 36 to 72 hours of exposure, depending on the route of exposure (inhalation, ingestion, or injection) and the dose received. If we suspect that people have inhaled ricin, a potential clue would be that a large number of people who had been close to each other suddenly developed fever, cough, and excess fluid in their lungs. These symptoms could be followed by severe breathing problems and possibly death. If in suspected situations where ricin may have been disseminated, preliminary environmental testing by public health or law enforcement authorities may detect ricin in powders or materials released into the immediate environment. Persons occupying such areas may initially be observed for signs of ricin poisoning. No widely available, reliable medical test exists to confirm that a person has been exposed to ricin. Because no antidote exists for ricin, the most important factor is avoiding ricin exposure in the first place. If exposure cannot be avoided, the most important factor is then getting the ricin off or out of the body as quickly as possible. Symptomatic ricin poisoning is treated by giving victims supportive medical care to minimize the effects of the poisoning. The types of supportive medical care would depend on several factors, such as the route by which victims were poisoned (that is, whether poisoning was by inhalation, ingestion, or skin or eye exposure). Care could include such measures as helping victims breathe, giving them intravenous fluids (fluids given through a needle inserted into a vein), giving them medications to treat conditions such as seizure and low blood pressure, flushing their stomachs with activated charcoal (if the ricin has been very recently ingested), or washing out their eyes with water if their eyes are irritated. First, get fresh air by leaving the area where the ricin was released. If the ricin release was outside, move away from the area where the ricin was released. If the ricin release was indoors, get out of the building. If you are near a release of ricin, emergency coordinators may tell you to either evacuate the area or to “shelter in place” inside a building to avoid being exposed to the chemical. For more information on evacuation during a chemical emergency, see Facts About Evacuation. For more information on sheltering in place during a chemical emergency, see Facts About Sheltering in Place. If you think you may have been exposed to ricin, you should remove your clothing, rapidly wash your entire body with soap and water, and get medical care as quickly as possible. Quickly take off clothing that may have ricin on it. Any clothing that has to be pulled over the head should be cut off the body instead of pulled over the head. As quickly as possible, wash any ricin from your skin with large amounts of soap and water. Washing with soap and water will help protect people from any chemicals on their bodies. If your eyes are burning or your vision is blurred, rinse your eyes with plain water for 10 to 15 minutes. If you wear contacts, remove them and put them with the contaminated clothing. Do not put the contacts back in your eyes (even if they are not disposable contacts). If you wear eyeglasses, wash them with soap and water. You can put your eyeglasses back on after you wash them. After you have washed yourself, place your clothing inside a plastic bag. Avoid touching contaminated areas of the clothing. If you can't avoid touching contaminated areas, or you aren't sure where the contaminated areas are, wear rubber gloves, turn the bag inside out and use it to pick up the clothing, or put the clothing in the bag using tongs, tool handles, sticks, or similar objects. Anything that touches the contaminated clothing should also be placed in the bag. If you wear contacts, put them in the plastic bag, too. For more information about cleaning your body and disposing of your clothes after a chemical release, see Chemical Agents: Facts About Personal Cleaning and Disposal of Contaminated Clothing. If someone has ingested ricin, do not induce vomiting or give fluids to drink. This fact sheet is based on CDC’s best current information. It may be updated as new information becomes available.